Fitment confirmed for 2014 IS250/350 and IS-F model years! Easy install well made would recommend!! All pieces of the kit are made from quality materials and have a nice finish to them. Fitment onto the car is top notch and feels solid as you are tightening it into the thread on the bumper. License plate holder is also made from sturdy material that does not flex even when pushing on it hard. Feel re-assured that when traveling at speed this is not going to bed back and scratch your bumper. Definitely a product worth purchasing. I bought this for my 2017 is350 f sport. It fit perfect and I am 100% satisfied with how it turned out. I also had one for my last car a 2012 Subaru WRX. The quality of this is amazing and it still looked new after about four years. I highly recommend this as an option for your license plate! I installed this on my 2017 Lexus CT200H F Sport and the fitment is excellent. Installed in minutes. My FRS also has one installed for 2 years now with no issues. Great Product, Easy to install, looks great. I will recommend you purchase this for the car! Definitely would recommend this to anyone looking for a side mount license plate holder. The install is easy and the product is sturdy and well made. Its a good fit with my gs350 f sport! The angle adjust helps alot with installation! Saved me from drilling holes on front bumper! ART helped me out with the purchase and let me tell you the customer service I got from this company is by far the best I have ever had! Military Discount was given and the sucker was at my house in 2 days!!! hope you guys make more cool stuff like this! I have already recommended this company with all my military buddies! Perfect fit on my ISF, angle is adjustable to get the plate nice and tight and unobtrusive on the car. Nice quality piece. Only thing that could be improved is to somehow make the hardware lock so the holder doesn't move. Seems to be staying in place but moves if you grab it, so be nice if it could lock somehow. 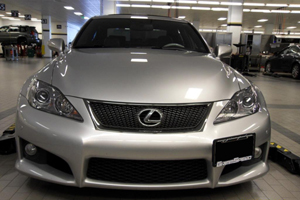 FOR LEXUS IS 250 2014, EASY TO INSTALL VERY SECURE AND LOOKS GREAT! What a great invention! The grill on the new 2014 Lexus IS models consumes the front end. We love the look of the grill and really didn't want to take away from its look by mounting a license plate in the center. The relocation kit allowed us to mount it to the side of the grill and at such an angle that we are not blocking the air intakes for the brakes or the headlight. It installed in a few simple steps. Highly recommend this product for any vehicle where you are required to have a front plate but don't want to detract from the look of the car.